If you own a Ford truck or SUV, at some point you may want to know what your Ford Truck’s Towing Capacity is. We have provided some baseline stats, but if you want to know even more about your particular Ford vehicle, you can do a vehicle Vin Number lookup (More on that later). Tongue Weight: Is a measurement of the downward force that the tongue of the trailer exerts on the hitch that is connected to a vehicle. One important factor to remember is tongue weight can affect a vehicle’s capability to drive safely. Having a tongue weight that is too high or too low should be avoided. One recommendation is to try and keep the tongue weight around 9-15% of your trailer’s gross weight. Gross Axle Weight Rating (GAWR): Simply refers to the maximum distributed weight rating that may be supported by an axle. Ford truck axles have specific GAWRs specifications. Gross Vehicle Weight Rating (GVWR) or gross vehicle mass (GVM): Is the maximum weight of a loaded vehicle (vehicle + passengers + cargo) without factoring in a trailer. The GVWR is specifically provided by Ford for their trucks. Gross Trailer Weight (GTW): Gross trailer weight is the actual weight of your fully loaded trailer (trailer + cargo), which includes the weight of the trailer itself plus everything loaded onto it or into it. Using a Truck/Car scale is the easiest way to determine weight. Gross Combined Weight Rating (GCWR): GCWR is a combination of Gross Vehicle Weight Rating (GVWR) + Gross Trailer Weight (GTW). Explorer: The 2019 4Runner has a towing capacity of 5,600 lbs. Expedition: The 2019 Expedition has a towing capacity of 5,900 to 6,000 lbs. depending on trim level. Flex: The 2019 Flex has a towing capacity of 2,000 lbs. Edge: The 2019 Edge has a towing capacity of 1,500 – 3,000 lbs. F-150: The 2019 F-150 has a towing capacity of 5,000 – 13,000 lbs, depending on how the vehicle is configured. 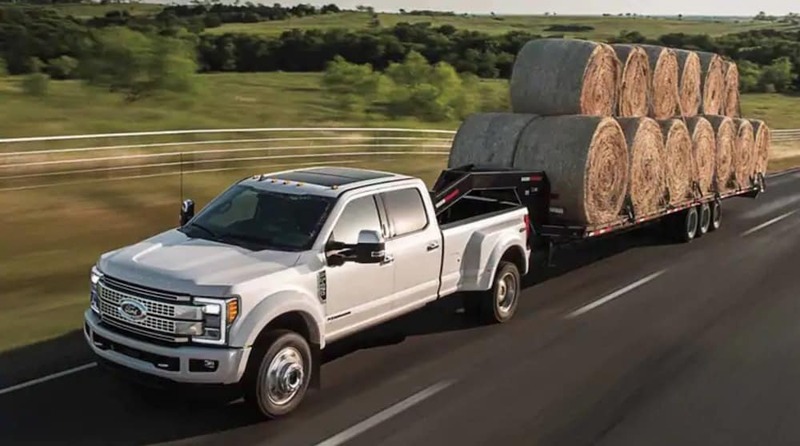 Super Duty: The 2019 Super Duty has a towing capacity of 21,000 lbs. Add a 5th wheel and towing capacity can increase up to 27,000 lbs and up to 35,000 lbs with a Gooseneck option. Note: Max Towing Capacities may vary based on Ford truck or SUV models and options. Please check with your Ford Dealer to get the most up to date and accurate information. Ford’s website doesn’t currently provide Ford truck and SUV owners a way to get information on their vehicles by using the VIN number. Fleet Ford has a towing guide for Ford trucks. There is also a VIN decoder on a Ford Truck Enthusiasts Forum. Don’t own a Ford Truck or SUV; check out TAP’s website for Vehicle Towing Capacity by VIN.